Mullet Architecture: FLLW and Hans Scharoun. 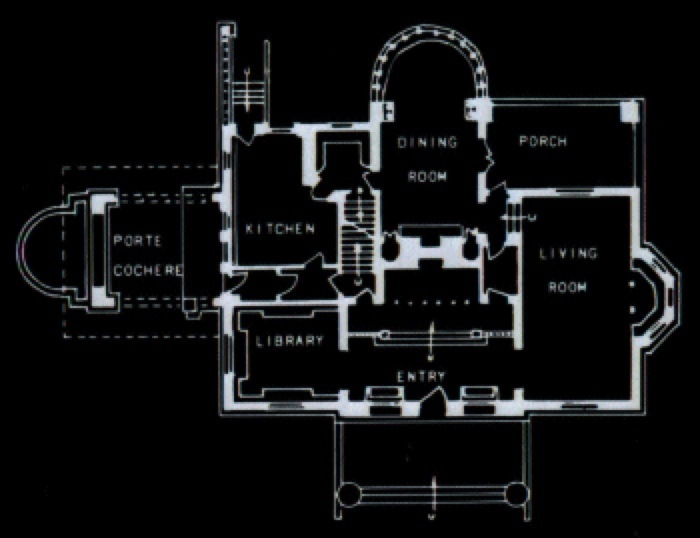 FLLW:Winslow House Plan. 1894. Business in the front, party in the back. Throughout history Architects have given clients the most bang for their buck by putting all the “architecture” on the street facade. This is done to show off to the public. The utilitarian needs of the building behind the main facade are clad functionally and without elaboration. Renaissance and Baroque Churches have grandiose front facades, many times larger than they need to be to project a massive building. The false front covers up an ordinary church behind it. This was also utilized in old west buildings, where simple gabled wood construction buildings had large, oversized fronts decorated and bejeweled in various ways. Even today this can be seen in any upper middle class suburb. The front of the house is clad in a brick veneer while the sides and back are covered in cheaper vinyl siding. This is what I call reverse mullet architecture. It is party in the front and business in the back. The duality of the building (that being the aesthetic thrust versus the utilitarian thrust) is distilled between front of the house delight to back of the house commodity. Only during the emergence of modernism did this duality shift. This antipode I deem Mullet Architecture. In this instance, however, it is not about delight and commodity, it is a reaction to the conservative eye of the time. 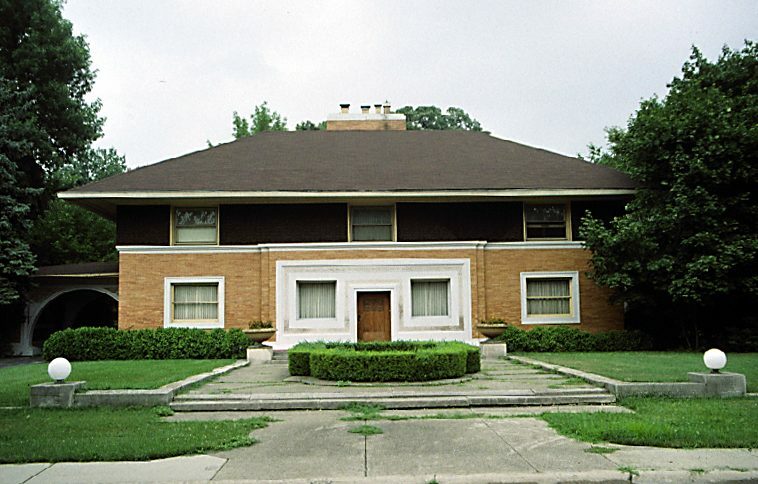 Frank Lloyd Wright’s Winslow House of 1894 is an early and potent example of Mullet Architecture. Wright designed the front facade of the house in a more conservative manner giving it symmetry and weight. The front entrance is clearly inspired by certain mausoleums Sullivan was working on at the time. The ornamentation as well is very much in the vein of Sullivan. So even though this is conservative by our standards of Wright, it was still deemed highly modern at the time. Even so, Wright’s truly revolutionary ideas about domestic architecture are subdued in the front of this house. Only in the back does one start to get an idea of where Wright was really headed. The back of the house, in marked contrast to the front, is asymmetrical in plan and elevation. The dining nook thrusts out into the backyard in a semicircle while the stair tower rises above the roof plain, like a castle turret, in the shape of a half octagon. 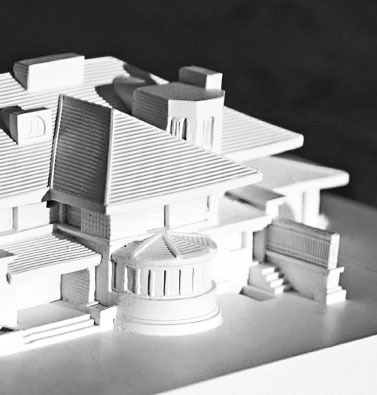 These extruded basic geometries evoke the Froebel block teachings of Wright as a boy, but they also suggest the asymmetrical massing of Henry Hobson Richardson, another of Wright’s influences. In order to “blend” more clearly with the surrounding neighborhood, Wright played all of his fun games with architecture on the back facade of the house while keeping the front relatively subdued and orderly. It was strictly business in the front, while the party stayed in the back! This is building as duality, where sobriety and order dominate the front, playfulness and asymmetry dominate the back. It was just a matter of a couple years before Wright would abandon this conciliatory gesture towards the neighbors and really start on his revolutionary prairie style. Here the party would be all around in a pinwheel of asymmetrical projections. 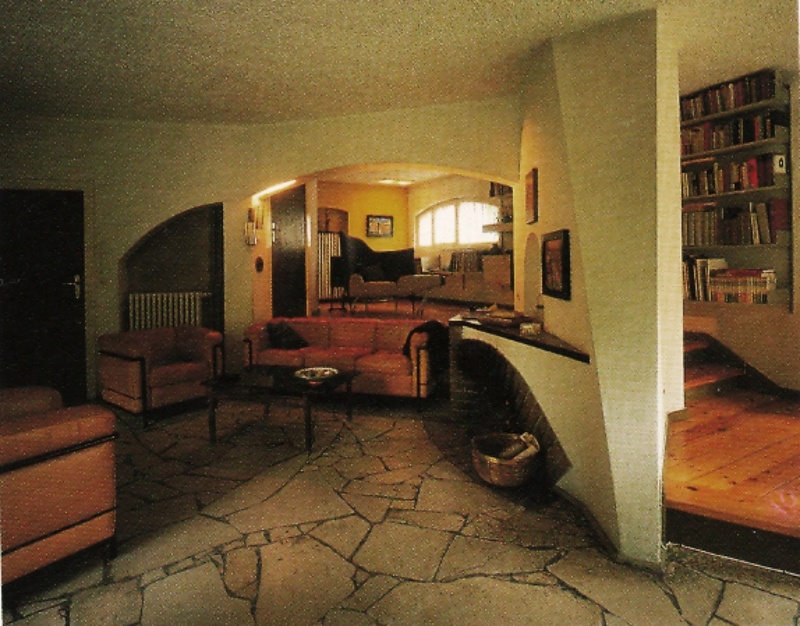 Hans Scharoun :Schminke House. 1930. Before the Nazi’s ruined everythihng. 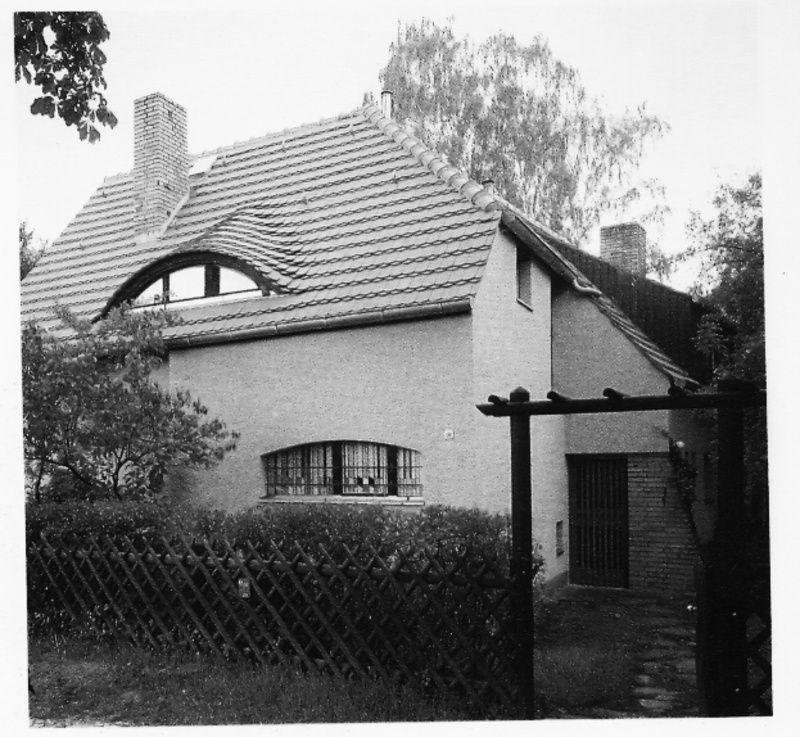 A much more grim circumstance of Mullet Architecture can be found in the World War II era domestic work of Hans Scharoun. Unlike Gropius, Neutra and Mies, Scharoun stayed in Germany while the gauntlet of artistic freedom, especially of the Modernist idiom, was systematically and disturbingly dismantled by the Nazi regime. The Bauhaus was closed and book-burning campaigns tried to eradicate all things unpatriotic to the German Motherland. Modern Art and Architecture and its aim for a universal message were deemed un-German. A new era of nationalism steered the arts and architecture into the direction of traditional vernacular forms. Hans Scharoun had made many interesting Modernist designs before the Nazi rise to power, including a dwelling at the Weissenhofsiedlung, and, most notably, the Schminke house of 1930. Scharoun: Front and interior view of the Mohrmann House. 1939. Once the Nazi hammer came down, in the form of strict building codes, Scharoun was forced to make markedly more conservative designs for fear of being in trouble with the powers that be. On top of this, the war effort needed steel, so Scharoun was required to build with more traditional masonry. It must have been a terrifying time for the architect. The artist in him found ways to subvert these stringent aesthetic requirements. The Mohrmann house of 1939 has a gabled front facade that looks like a quaint little cottage. It is business in the front. In the back however, we see the irreverent freedom Scharoun found on the private facades of his houses. The back of the house is clearly asymmetrical. The walls are at all kinds of strange angles. Even in section, the house is split up in many different levels. The flooring in the front part of the house is traditional hardwood, while the living portion in the back is floored in various sized shards of stone pieced together like a broken plate. Scharoun justified these seemingly arbitrary planning effects as being influenced towards maximizing the land and the views of the specific location. More interestingly though is the contrast that these wild angles have with the front facade. The front gives no indication of what’s happening in the back. 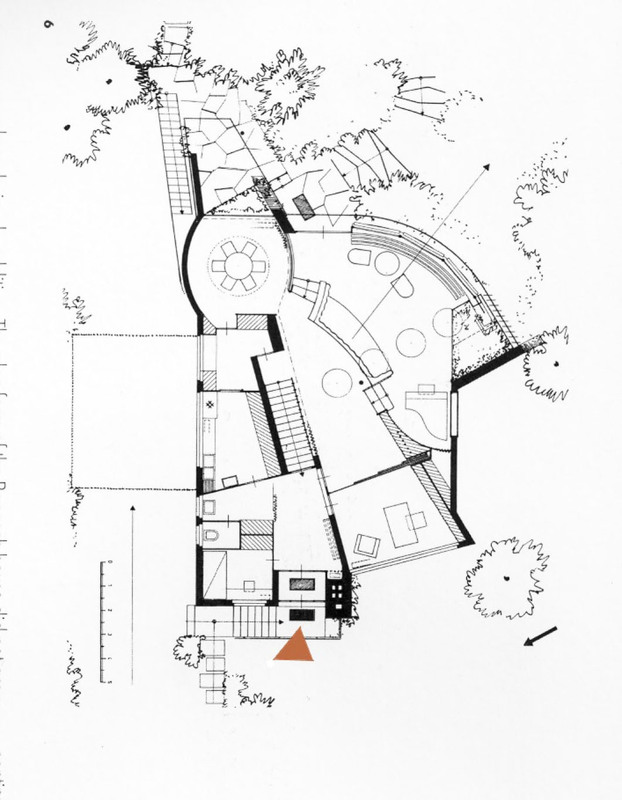 My favorite example of this Mullet Architecture by Scharoun is the Baensch house of 1935. Here again the front is very conservative and meant to look like a traditional vernacular German cottage. In the back the building positively explodes in myriad angle, and curved surfaces. Another interesting thing to point out is his use of glass. The front of the house consists of the traditional windows punched into thick stucco, while the back opens up floor to ceiling glass views out to the private garden. In the living room, a convex built in couch thrusts one out into nature. Scharoun also seems to deconstruct the building itself as it meanders towards the garden side. 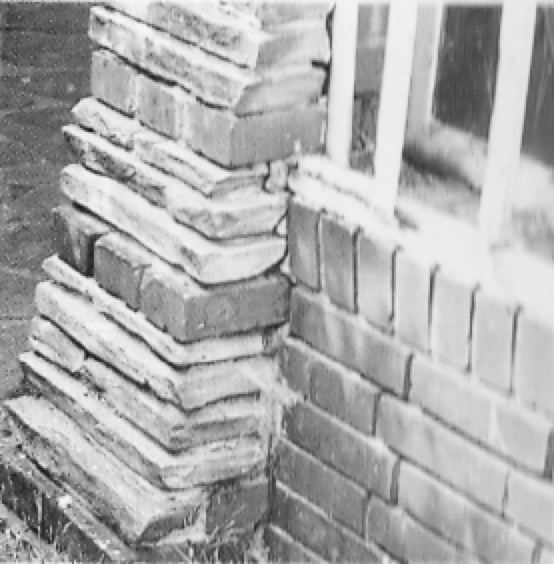 The ordered brick walls terminate on the garden side into crumbling serrated edges. This suggests the building going from order to chaos, as well as an attempt to integrate the building with nature via an aesthetic transition. It is also disturbing in imagining that Scharoun probably had experience with bombed fallout cities during WWI. These buildings show practical, and scary, reasons for creating architecture with a duality about it. 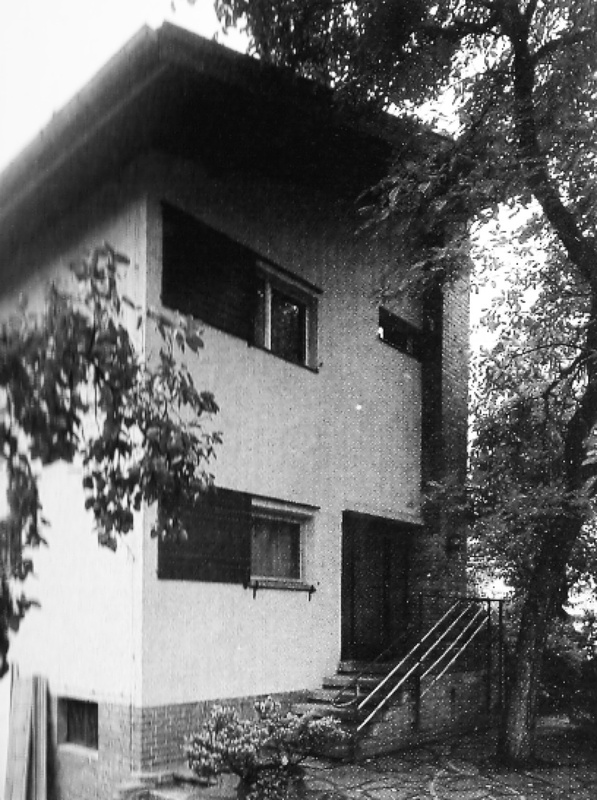 The Mullet architecture was essential for Scharoun to keep practicing during the Nazi era. After the war Scharoun abandoned his false facades and went further in his direction of organic building, with seemingly chaotic angles that suggested a strictly programmatic agenda. His buildings went where they wanted to now that they were free from the Nazi stranglehold. Mullet architecture was the reversal of the traditional way of making buildings. Buildings today are increasingly more driven to fit into the contexts in which they inhabit, in such a way that Mullet architecture may still have justification in certain locations. Some building codes in America, in the name of “beautification” sound almost as stringent as those laid out by the Nazis. I sure hope somewhere, in the sea of McMansions, a quaint Mullet building sits with an unassuming conservative front and a party in the back! 1 Response to Mullet Architecture: FLLW and Hans Scharoun.